This article is adapted from one of the units of Advanced Algorithmic Trading. If you like what you see, check out the entire curriculum here. Find out what Robot Wealth is all about here. The best place to start learning about neural networks is the perceptron. The perceptron is the simplest possible artificial neural network, consisting of just a single neuron and capable of learning a certain class of binary classification problems.1Perceptrons can solve linearly separable binary classification problems – more on this below. Perceptrons are the perfect introduction to ANNs and if you can understand how they work, the leap to more complex networks and their attendant issues will not be nearly as far. So we will explore their history, what they do, how they learn, where they fail. We’ll build our own perceptron from scratch and train it to perform different classification tasks which will provide insight into where they can perform well, and where they are hopelessly outgunned. Lastly, we’ll explore one way we might apply a perceptron in a trading system.2While perceptrons are the best introduction to neural nets for the uninitiated, personally I have my doubts about using them in algorithmic trading systems – it’s difficult to imagine that the classification tasks for which they are suited have relevance to the markets. 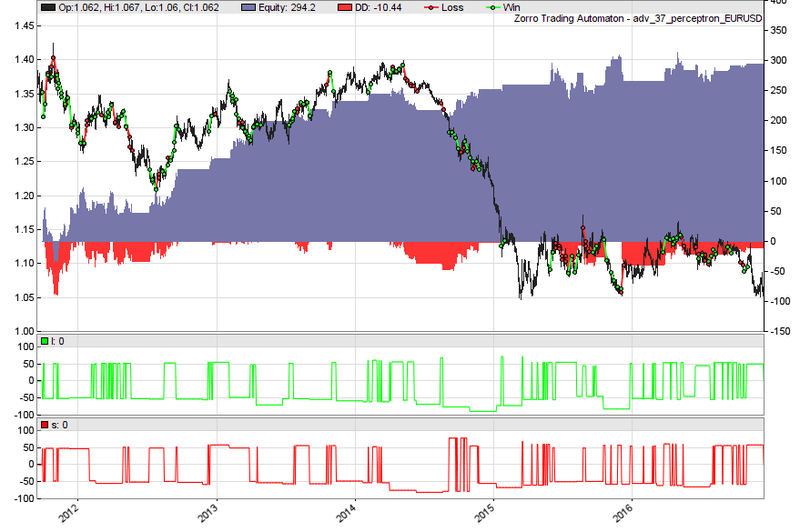 However, in the simple example below, my perceptron trading strategy returned a surprisingly good walk-forward result. Maybe they are worthy of a closer look after all. The perceptron has a long history, dating back to at least the mid 1950s. Following its discovery, the New York Times ran an article that claimed that the perceptron was the basis of an artificial intelligence (AI) that would be able to walk, talk, see and even demonstrate consciousness. Soon after, this was proven to be hyperbole on a staggering scale, when the perceptron was shown to be wholly incapable of classifying certain types of problems. The disillusionment that followed essentially led to the first AI winter, and since then we have seen a repeating pattern of hyperbole followed by disappointment in relation to artificial intelligence.3As an aside, there are a lot of reasons to think that this time might be different (indeed, that’s probably not even in question any more), including the exponential growth in both compute resources and data availability, as well as advances in computer science that enable efficient training of large neural networks. Algorithms modelled on biology are a fascinating area of computer science. Undoubtedly you’ve heard of the genetic algorithm, which is a powerful optimization tool modelled on evolutionary processes. Nature has been used as a model for other optimization algorithms, as well as the basis for various design innovations. In this same vein, ANNs attempt to learn relationships and patterns using a somewhat loose model of neurons in the brain. The perceptron is a model of a single neuron.4Note the words loose model of the brain. I recently undertook some study in computational neuroscience, and one of the surprising take-aways was how little we know about how the brain actually works, not to mention the incredible research currently being undertaken to remedy that. Here, \(x_1, x_2, etc\) are the inputs. \(b\) is called the bias term, think of it like the intercept term in a linear model \(y = mx + b\). \(w_1, w_2, etc\) are the weights applied to each input. 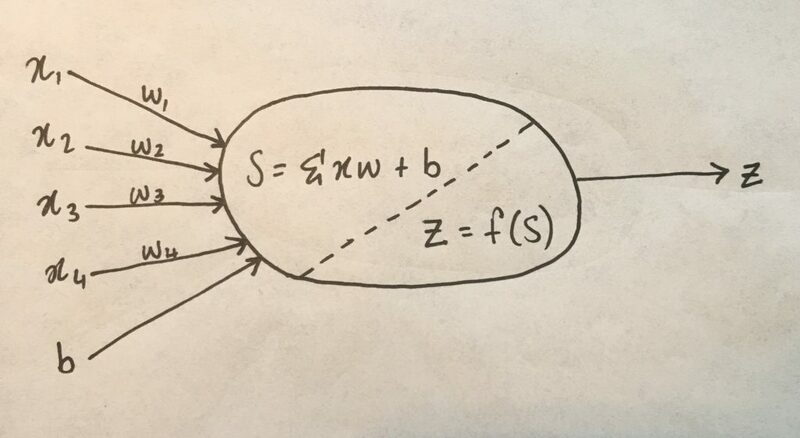 The neuron firstly sums the weighted inputs (and the bias term), represented by \(S\) in the sketch above. Then, \(S\) is passed to the activation function, which simply transforms \(S\) in some way. 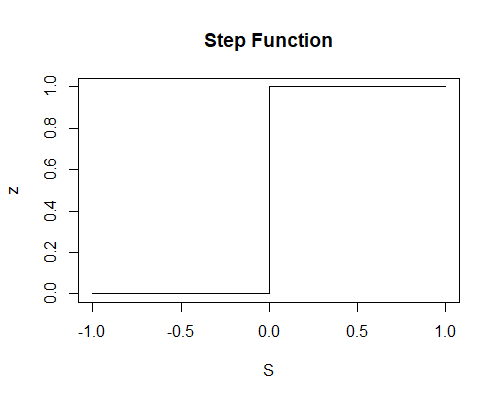 The output of the activation function, \(z\) is then the output of the neuron. 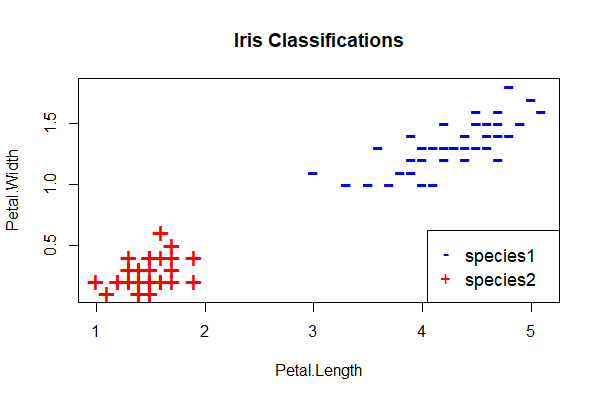 The idea behind ANNs is that by selecting good values for the weight parameters (and the bias), the ANN can model the relationships between the inputs and some target. 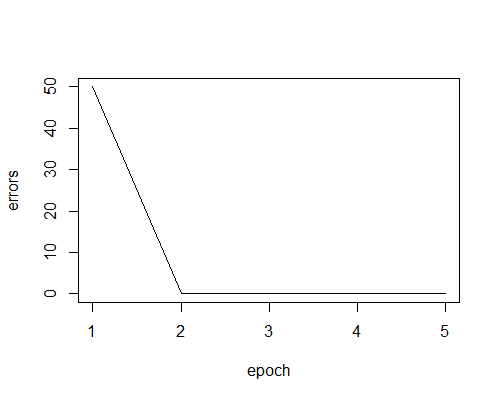 In the sketch above, \(z\) is the ANN’s prediction of the target given the input variables. 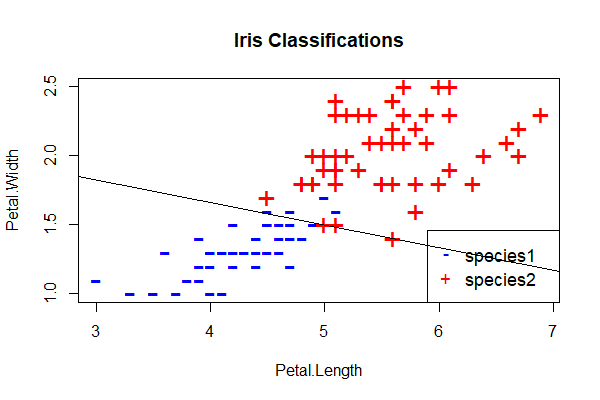 Recall that the perceptron is a binary classifier. That is, it predicts either one or zero, on or off, up or down, etc. It follows then that our activation function needs to convert the input signal (which can be any real-valued number) into either a one or a zero5or a 1 and a -1, or any other binary outputcorresponding to the predicted class. This function then transforms any weighted sum of the inputs (S) and converts it into a binary output (either 1 or 0). The trick to making this useful is finding (learning) a set of weights, \(w\), that lead to good predictions using this activation function. 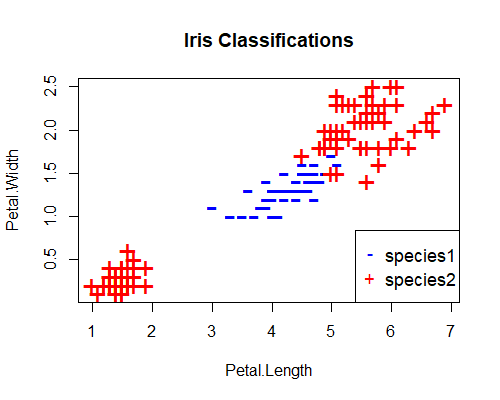 Next, we’ll code our own perceptron learning algorithm from scratch using R. We’ll train it to classify a subset of the iris data set.7The iris data is a standard machine learning data set and consists of 150 observations of specimens of iris flowers. 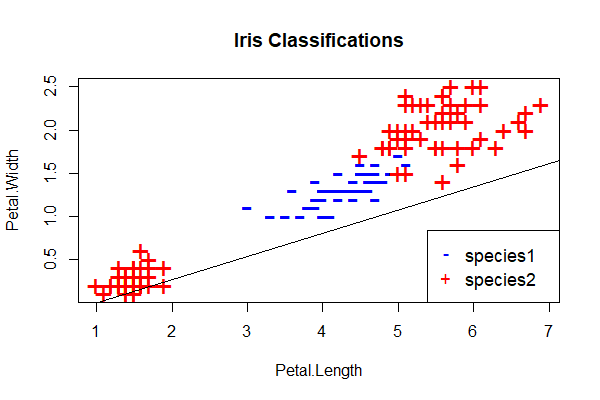 Each observation consists of four measurements (sepal length, sepal width, petal length and petal width) and the species of iris to which each observed flower belongs. 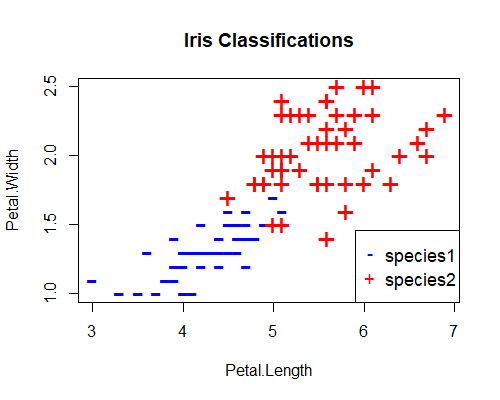 Three different species are recorded in the data set (setosa, versicolor, and virginica). 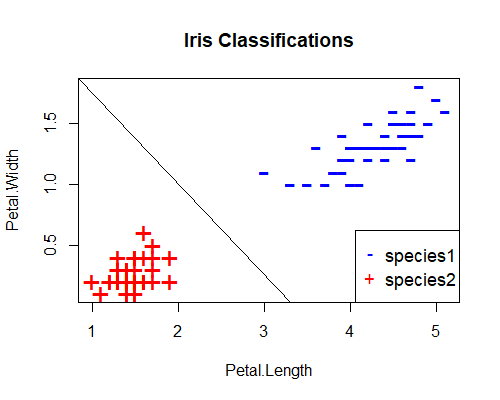 The problem of classifying the different species based on the measurements is not a particularly difficult task, and you’ll see this data set pop up time and again in demonstrations of machine learning. 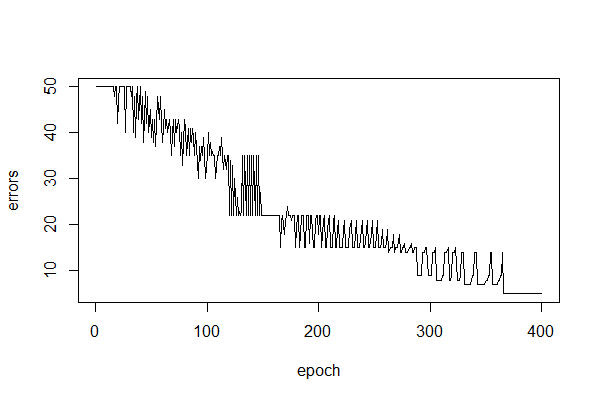 Another, perhaps more intuitive way, to view the weights that the perceptron learns is in terms of its decision boundary. In geometric terms, for the two-dimensional feature space in this example, the decision boundary is the a straight line separating the perceptron’s predictions. On one side of the line, the perceptron always predicts -1, and on the other, it always predicts 1.8In three-dimensional feature space, we would have a decision plane, and likewise in higher dimensions the corresponding decision boundary is in \(N-1\) dimensions, where \(N\) is the number of features or predictors. which defines a straight line in \(x_1, x_2\) feature space. might be in the wrong place. I had to move it then the script worked. Commenting the adviseLong and adviseShort helps but then it doesn’t make any sense. Error 062 occurs when Zorro can’t find a file it needs. 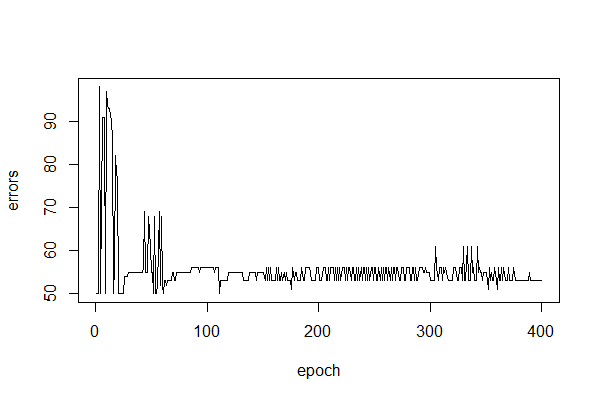 It could be that you didn’t train your perceptrons before trying to run a backtest? During the train process, Zorro outputs the perceptron as a .c file, which is of course required before running a simulation. If that’s the case, simply hit the [Train] button on the Zorro GUI, wait for training to finish, then hit [Test]. This error can also arise when Zorro doesn’t have the correct permissions to access the files it needs. In that case, try running Zorro with Admin privileges. However it looks good only till the end of Jan 2015 – by the end the next year it lost everything. BTW: ATR it very sensitive to the starting point of the time series: bars as old as 2000 ago can affect today results. It’s enough to shorten or lengthen the series to get different atr(10) at the end. What daily volatility almost six years ago has to today volatility? Yet it affects the atr outcome. So the dataset starting point may affect the results – did you try to move it backward or forward by a year or two?